A couple of days ago I picked up some nice Oyster and Lion's Mane mushrooms from one of the farmers at our biweekly farmers's market, and with cilantro on hand from my farm share and some gift sage from my former neighbors Kit and Carrie I decided to make an herby mushroom pasta sauce with them. The oyster mushroom (Pleurutus ostreatus), once a rarely-seen exotic, is now regularly available in supermarket produce shelves. However, they are delicate and the offerings I often see at the market are frequently ragged versions of their former selves, so I was happy to score this beatiful clump of 'shroomy goodness. Usually I braise these with olive oil, garlic and herbs because I like to preserve the form and shape of them rather than cutting them up for sauce, so I made the sauce with gentle methods to try to keep the petals whole as much as possible. The lion's mane (Hericium erinaceus), on the other hand, was new to me. Unfortunately the farmer selling them wasn't the producer (he said they came from a neighbor's farm) so I was frustrated in my attempts to learn much about them. However, from the information at the link it sounds like it must be a foraged, rather than cultivated, variety. If anyone knows more about them please leave a comment. In any case, it's a facinating object: about the size of a lumpy softball, with an exterior texture in my example sort of like worn terrycloth. The inside is pure creamy white, firm but not tough. The raw taste was clean yet mushroomy. The sauce I made is fairly straightforward and derivitive of many other mushroom sauces I've made over the years. The main new idea here was to braise the mushrooms in the broth and wine (instead of sautéing them), to minimize the damage to the large oyster mushroom petals. The topping, a variation of my wildly popular crunchy garlic, was an inspiration borne out of a bag of fennel trimmings in the fridge that wanted to be used for something. Sauté the garlic, fennel and bread crumbs in olive oil until golden brown. Remove with slotted spoon and drain on paper towels. Set aside. Slice the lion's mane into 1/4" thick slices. Gently separate the oyster mushroom petals. Chop any stem or core pieces from the oyster mushroom. Sauté the shallots and garlic in olive oil until the shallots just start to turn translucent. Remove from pan and set aside. Add some more olive oil to the pan and then the mushrooms. Gently stir them over medium high heat for a few minutes. Add the broth, tomato paste and wine, lower heat and cover. Cook for 8 minutes. Remove cover and stir gently over medium heat until the liquid is nearly gone. Stir in the reserved shallot/garlic mixture, sage, cilantro, butter, cheese and cream (if using). Season to taste with the fish sauce and hot sauce. Keep warm if the pasta isn't quite ready. Cook the pasta in boiling salted water. When cooked, remove a dozen or so of the larger mushroom pieces to a side plate. Then, with tongs, lift the pasta directly into the pan with the mushroom sauce, allowing a little of the pasta water to ride along. Over medium heat, lift and toss the pasta to mix with the sauce (be careful not to break up the mushroom pieces). To serve, place in a warmed pasta bowl. Top with the reserved mushroom pieces, a sprinkling of the fennel/garlic topping and, if desired, a stalk or two of chives. *Broth. There are commercial vegetable broths available but it's so easy to make whenever you have mushroom stems, vegetable trimmings, etc. Just put them in a pot, being sure to include something from the onion family, a carrot stub or two, some celery, some parsley and a bay leaf. (I vary this wildly according to what's at hand. Garlic, garam masala, fennel, whatever.) Add water to cover and simmer for an hour or so. Cool and strain through a sieve, pressing to get all the liquid. I never season the broth, preferring to season the dishes it goes into instead. Freeze until needed. Oyster mushrooms are great. I have never heard of Lion's Main - they look awesome. Mushrooms, wine, herbs, pasta - always a winner with me. I'd never heard of Lion's Mane mushrooms...interesting. Looked them up and supposedly they have medicinal value. Reminds me of a puffball, only smaller. Dig that man--thanks for the spontaneity. I'm growing Lion's mane and looking forward to the time they pop, because gee whilikers, I'll try this recipe. I've heard that sauteing LM with butter and onions converts it into a sort of lobster taste. Can you dig it? 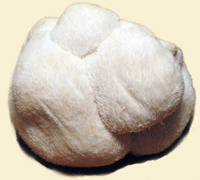 I bought indoor grow kits of Lion's mane from Fungi Perfect. I had my first sample today so I just sauteed the slices in butter. I let them brown but they were quite chewy closer to where the small stalk is. I love mushrooms and I am very pleased I can grow the Lion's Mane indoors. You can also get mushroom kits at www.fieldforest.net I just ordered some Oyster Mushroom kits and a Lion's Mane kit. 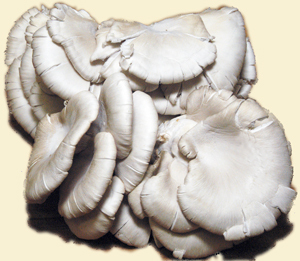 The oyster mushrooms can grown on toilet paper, old paperback books, and even used coffee grinds! The oyster mushroom kit that I got included Golden Oyster Mushrooms, Italian Oyster Mushrooms, and Grey Dove Oyster Mushrooms.